At the end of the course, you'll take a longer quiz that makes sure you have all the key concepts and ideas down. You and your NANAIMO DIVE OUTFITTERS Instructor will review anything that you don't quite get until it's clear. This is what it's all about – diving. You develop basic scuba skills by scuba diving in a pool or body of water with pool-like conditions. Here you'll learn everything from setting up your scuba gear to how to easily get water out of your scuba mask without surfacing. You'll also practice some emergency skills, like sharing air or replacing your scuba mask. Plus, you may play some games, make new friends and have a great time. There are 6 hours of confined water dives, building gradually upon each of the skills you learn. Over the course of these confined water dives, you attain the skills you need to dive in open water. After your confined water dives, you and the new friends you've made continue learning during four open water dives with your NANAIMO DIVE OUTFITTERS PADI Instructor at a local dive site. This is where you fully experience the underwater adventure – at the beginner level, of course. You may make these dives around the Nanaimo area or at a more exotic destination while on a NANAIMO DIVE OUTFITTERS group holiday or on your own warm water vacation. 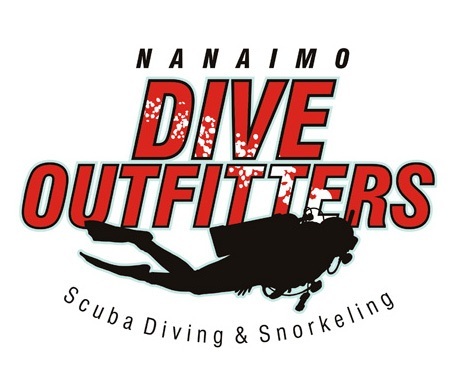 The normal course time offered by NANAIMO DIVE OUTFITTERS is one week, although shorter, private lessons are also available. The normal schedule is 4 evening of academics, 3 evenings of which you also head to the pool for skill development. You finish the week with 2 days in the ocean. The PADI Open Water Diver course is incredibly flexible and performance based, which means that NANAIMO DIVE OUTFITTERS can offer a wide variety of schedules, paced according to how fast you progress. Your instructor's interest is in your learning to scuba dive, not in how long you sit in a class. So, training is based upon demonstrating that you know what you need to know and can do what you need to do. This means that you progress at your own pace – faster or slower depending upon the time you need to become a confident scuba diver who dives regularly. Learning to scuba dive is a great value when you consider that you learn to dive under the guidance and attention of a high trained, experienced professional - your NANAIMO DIVE OUTFITTERS PADI Scuba Instructor. From the first day, scuba diving starts transforming your life with new experiences you share with friends. And, you can do it almost anywhere there is water. Start learning with NANAIMO DIVE OUTFITTERS and get ready to take your first breath underwater! NANAIMO DIVE OUTFITTERS is proud to be able to offer the PADI Open Water Course from $450 - $525 (+tax) per person. Choosing and using your scuba gear is part of the fun of diving. NANAIMO DIVE OUTFITTERS will help you find the right gear. Each piece of scuba equipment performs a different function so that collectively, it adapts you to the underwater world. Easy. There is no best gear. But, there is the best gear for you. The professionals at NANAIMO DIVE OUTFITTERS are trained to help you find scuba gear that best matches your preferences, fit and budget. These professionals can get you set with the right stuff, plus they provide service and support for years of enjoyable and dependable use. Students younger than 15 years, who successfully complete the course qualify for the PADI Junior Open Water Diver certification, which they may upgrade to PADI Open Water Diver certification upon reaching 15. You must be at least 13 years old to take scuba lessons online with PADI eLearning, due to international internet laws. If you're younger, you can still learn to dive – just have your parent or legal guardian contact NANAIMO DIVE OUTFITTERS. About Physical Challenges: Any individual who can meet the performance requirements of the course qualifies for certification. There are many adaptive techniques that allow individuals with physical challenges to meet these requirements. Individuals with paraplegia, amputations and other challenges commonly earn the PADI Open Water Diver certification. Even individuals with more significant physical challenges participate in diving. Talk to your PADI Instructor at NANAIMO DIVE OUTFITTERS for more information. The only truly important thing about where you dive is that you have the scuba diving training and experience appropriate for diving there, and that you have a dive buddy to go with you. NANAIMO DIVE OUTFITTERS can help you organize great local diving or a dive vacation. Visit today to get started. Contact NANAIMO DIVE OUTFITTERS for information about exposure protection needed for any of your diving. When you're lucky, you'll get to see a shark, but not generally in our area. That's not likely because you have a gauge that tells you how much air you have at all times. This way, you can return to the surface with a safety reserve remaining. But to answer the question, if you run out of air, your buddy has a spare mouthpiece that allows you to share a single air supply while swimming to the surface. There are also other options you'll learn in your PADI Open Water course with NANAIMO DIVE OUTFITTERS. People find the “weightlessness” of scuba diving to be quite freeing. Modern scuba masks are available in translucent models, which you may prefer if a mask makes you feel closed in. During your scuba diving training with NANAIMO DIVE OUTFITTERS, your instructor gives you plenty of time and coaching to become comfortable with each stage of learning. Your scuba instructor works with you at your own pace to ensure you master each skill necessary to become a capable scuba diver who dives regularly. NANAIMO DIVE OUTFITTERS keeps classes small so that we can give you more time to get comfortable with the amazing world of diving.